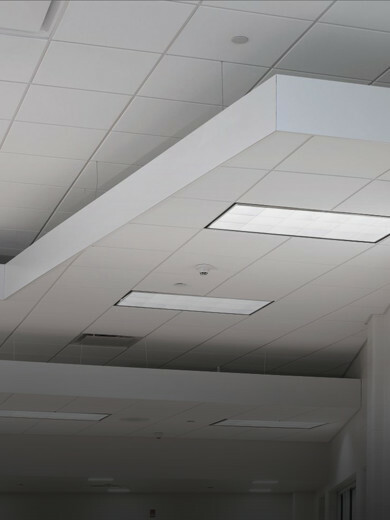 Suspended ceiling looks great both at home and in office, so is widely used in domestic and commercial premises arrangement, it has a lot of privileges,quick installation and dismantling, will embody even the most exclusive design solution, chosen individually for each client. Choosing the type and structure of the ceiling, you need to pay attention not only to the aesthetic approach, but also to the practical. One of the universal building materials is a plasterboard, which has a number of advantages. First of all a plasterboard is a non-toxic environmentally friendly material with no smell, which providing a favorable microclimate in the room. Knauf gypsum boards meet international standards and are used by Vitality Contractors LTD specialists. They carry out original design projects, not only for finishing ceilings, but also for walls, ventilation shafts and basements, as well as for the construction of various types of structures. Plasterboard is attached to a finished surface to the carcass structure. The frame is made on the metal profile due to the fact that one standard size sheet of plasterboard 3 square meter weighs 29 kg. Thus, talking directly about plasterboard ceilings, the metal frame construction is the best. Let's consider a number of advantages of such installation. First, the metal construction is quite strong and durable. Secondly, changes in temperature and humidity doesn’t influence the sizes of construction. Installing a plasterboard ceiling, there is a possibility of thermal or acoustic insulation using mineral wool Knaufinsulation, as it keeps the heat well in winter and does not miss the heat in summer, so it provides you peace and comfort at any time of the year. The essential privilege of the plasterboard ceiling is that all communications are perfectly hidden under it, an even and smooth, uniform surface without roughness, suitable for most decorative trims and finishes is immediately created without need of additional materials and work. At the same time, if the original whitewash remained on the ceiling, then there is no need to wash it, so that reduces the repair time and saves money. In addition, any type of plasterboard is suitable for fixing on a metal structure. Plasterboard is a very plastic material, therefore almost any surface shape can be made from it without restrictions, including curvilinear. Multi-level or combined ceiling complicates and visually increases the space of the room. Such a technique can be applied boldly not only for domestic premises, but also for creating, for example, a conference hall. And it will be appropriate to mount in it point lighting from any kind of fixtures: both open and closed - all of them are easily mounted in the plasterboard suspended ceiling in order to emphasize the interior design. In combination, all the advantages of this type of ceiling treatment will ensure the guaranteed success of your project, because there are practically no restrictions. We use a high-quality British Gypsum Ltd plasterboard in our work. Metal frame plasterboard ceiling will become a durable and functional element of the premises design for many years to come.